Ever get these really huge cravings for sweets? Oh, who am I kidding, we all do! But if you’re on a strict diet that prevents you from having refined sugar and/or flour, your dessert options are quite limited. If you still want to treat yourself from time to time, this ice cream might just be the solution for you. Yes, bananas are full of natural sugars, but these are different than refined sugars. 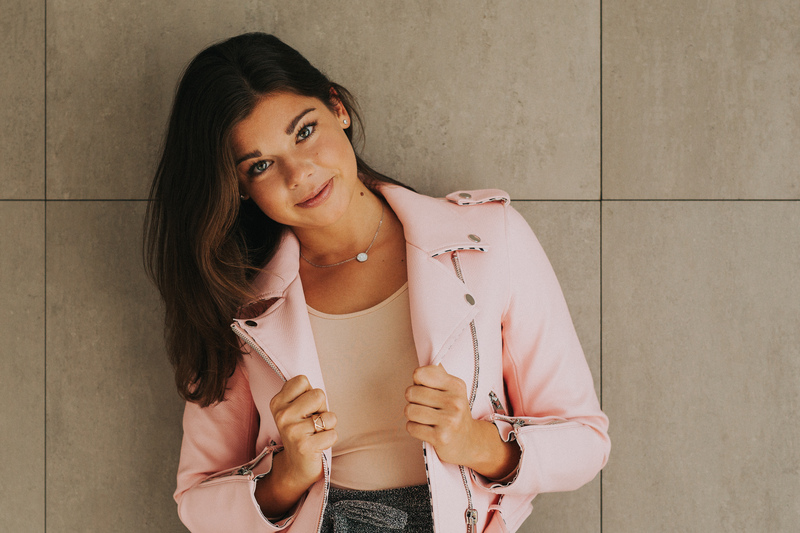 “How the body metabolizes the sugar in fruit and milk differs from how it metabolizes the refined sugar added to processed foods. The body breaks down refined sugar rapidly, causing insulin and blood sugar levels to skyrocket. Because refined sugar is digested quickly, you don’t feel full after you’re done eating, no matter how many calories you consumed. The fiber in fruit slows down metabolism, as fruit in the gut expands to make you feel full.”* You shouldn’t overeat the natural sugars either, but if you do need something sweet they are by far a better option. All you need are 4 medium size bananas (the riper the sweeter), 150 ml of greek yogurt and 1 1/2 to 2 scoops of Banana Whey Protein (I used MyProtien which tastes exactly like my favorite banana yogurt from my childhood). The bananas can either be already frozen or you can use fresh. I find it that my smoothie maker in which I made this ice cream mixes the fresh ones easier. 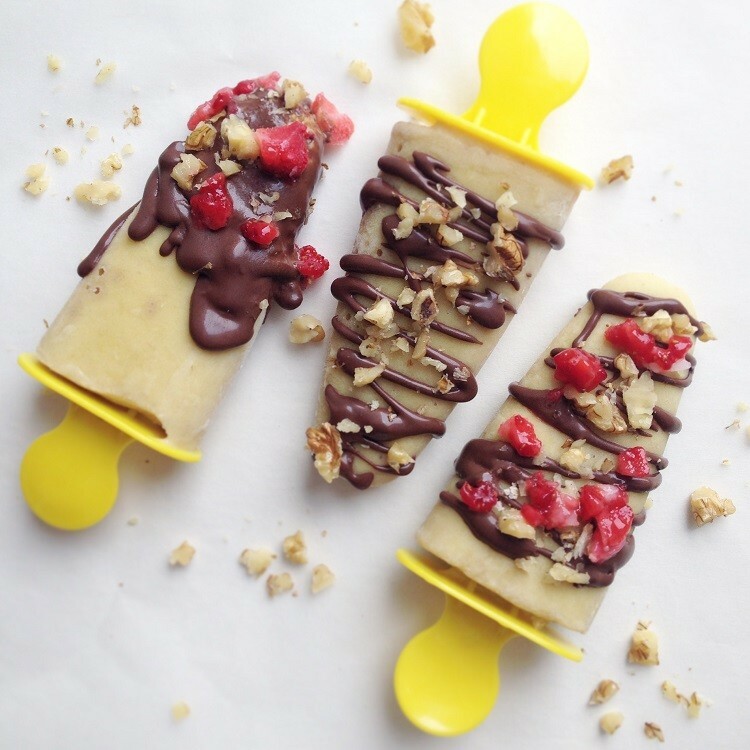 But if you have a strong blender, feel free to use frozen bananas in this recipe. To make this dessert more nutritious, I added two sources of protein – Greek yogurt and proteins. 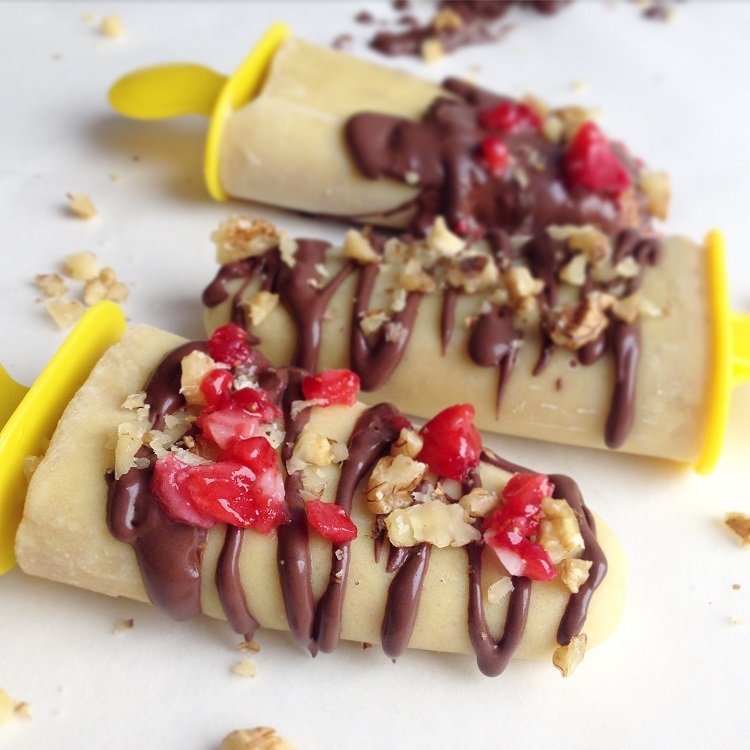 You can simply use just bananas but the yogurt will give the ice cream a smoother texture and the proteins will give it extra flavor and nutritional value. 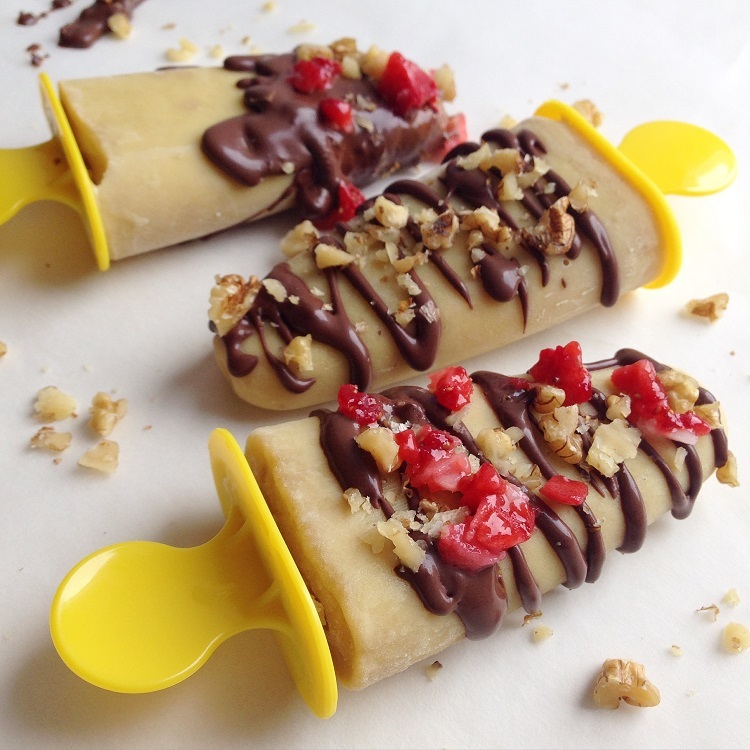 I suggest making popsicles like these for your banana ice cream if you don’t plan on eating it right away, since it tends to freeze quite hard and is therefore hard to get out of a container. It’s not impossible, though. Pour the mixture in desired containers and freeze over night. If you do end up making popsicles, simply pour some warm water over them when ready to eat and you’ll get the ice cream out in no time. 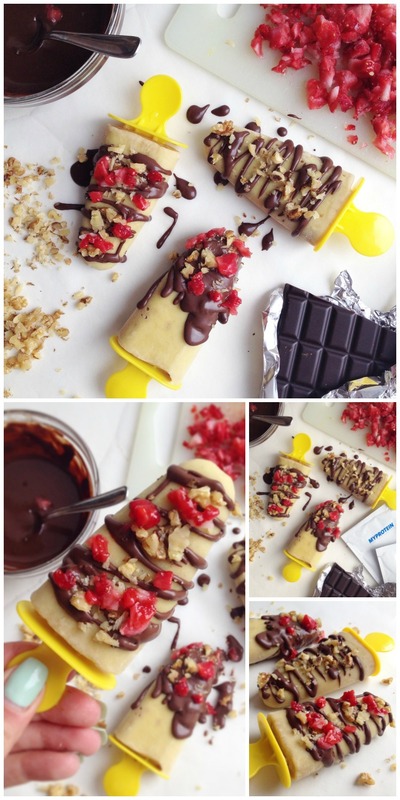 Decorate them with some dark chocolate, crushed nuts and chopped frozen strawberries and your delicious healthy treat is ready to cool you down on a hot summer day or just to take care of the sweet tooth of yours. Simply mix all ice cream ingredients in a blender, smoothie maker or food processor and pour the mixture in popsicle moulds or containers. Freeze over night and enjoy with your favorite toppings.